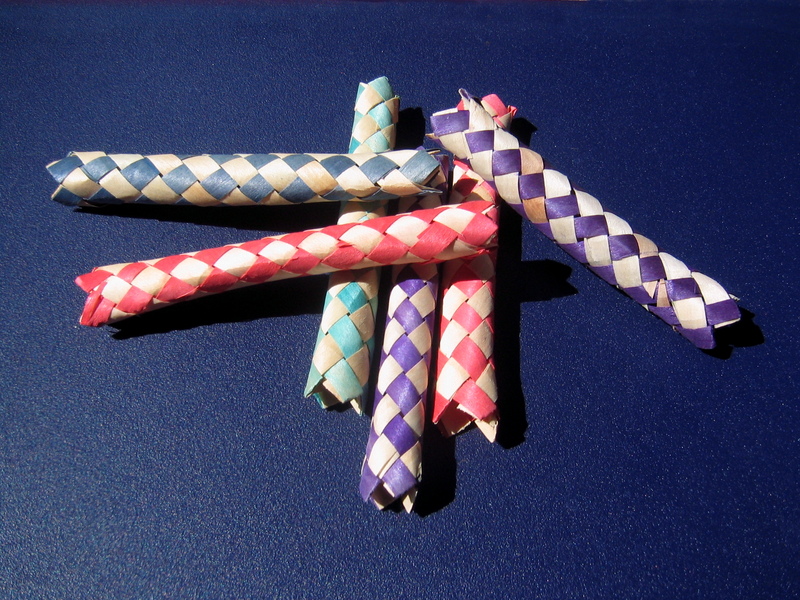 Chinese finger trap (also known as Chinese finger prison, Chinese finger cuffs, Chinese finger puzzle, Chinese handcuffs, Mexican finger fun, Chinese finger torture and Mexican handcuffs) toys. Via Carol at Wikipedia. Oh! Once I saw the photo I knew what these were. I had a few as a kid. I would have called this EurRail, or EuroRail, but apparently I would have been wrong. I knew both parts of this word, but I didn’t recall seeing them put together. I think Bufty is great, especially since you don’t really know what it means! Makes it even more fun to use. LOL! I’ve got several Chinese finger cuffs rolling around in our junk/candy drawer right now. We had them on the table at my daughter’s bday party. They used to freak me out when I was really little because I’d panic and couldn’t get my fingers out. I grew up in South Texa and they always had those at Mexican restraunts and in pinatas. And ditto Lisa on bufty. The mystery adds to the fun of it. I knew the first 2 but the others are new to me. Have a great day! I’d forgotten about the Chinese finger traps. I agree with Lisa on bufty. I think I’ll make up my own definition and use it in the next day or two. It will be my own personal joke – and yours as well. We used to have Chinese finger cuffs, but I don’t think we knew what to call them. Thanks for the picture! Awww, I love moppet! And bufty is totally new to me. Boy, do I remember those Chinese finger cuffs. I’m not sure what we called them, though.